Are you ready for another Before & After? I inherited this chair from my late grandmother and have been meaning to get it reupholstered for the longest time. She called it her 'pregnant chair' because it was the only chair she found comfortable to sit in while she was pregnant each time with her four children. No, I'm not pregnant in case you're wondering! Here is the the chair BEFORE. 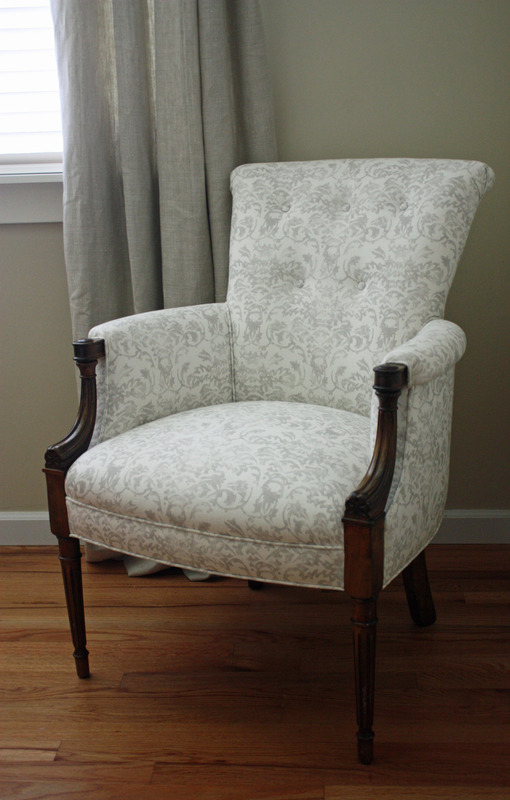 It has a great shape, but the fabric needed to be replaced and was original to the chair which is from the 1940's. The wood was in great condition, so I decided to keep it and not paint it. I chose this linen fabric from Weitzner to update the look. The fabric is available 'to-the-trade' only. My upholsterers worked their magic and I couldn't be more thrilled with the end result! I think my grandmother would be pretty happy with it too! The chair now sits in the corner of my guest bedroom and it makes me think of her every time I see it.